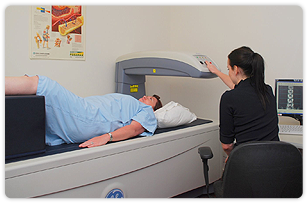 DEXA (dual energy x-ray absorptiometry) is used to measure bone mineral density (BMD). The technique uses very low dose x-rays and is a safe and painless procedure. The entire procedure lasts approximately 20 minutes. Low bone density or osteoporosis is a major determinant of fracture risk and is common, particularly in women following menopause. Loss of bone density may also be accelerated in conditions affecting the liver and thyroid gland and by certain medications, in particular, steroids. Measurement of the spine and hip is routinely performed and measurement of the forearm may also be undertaken if required. *Medicare has strict guidelines for the rebate of DEXA examinations. Please check with our staff when making your appointment to ensure that you are eligible for a Medicare rebate. Please remember to bring all previous x-rays and imaging investigations with you to your appointment.